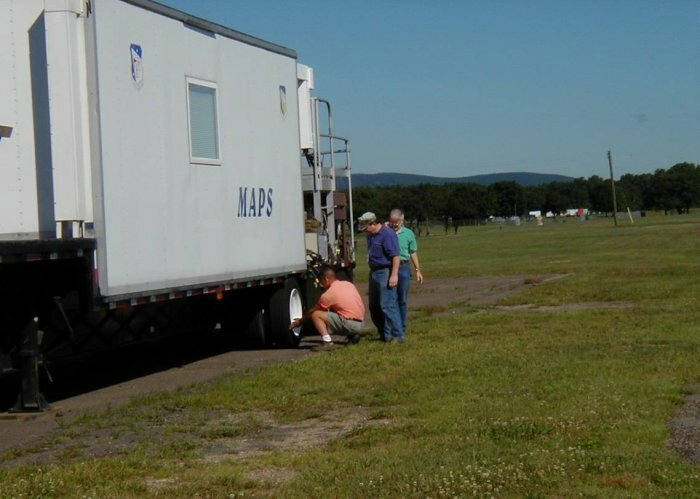 MAPS trailer at Westover AFB. The Special Projects team inspects MAPS prior to its final trip to Eglin AFB. The tread on one tire was found defective and the tire was replaced. Key members of the Special Projects team are (left to right) Ed Wong, Killer Kocinski, and John Kapitzky. Ed built RAVIN, Killer was the product manager for all Special Projects instrumentation, and Kapitzky was the software guru for all Special Projects imaging systems. Credit: Photo courtesy of Doc Ewen.